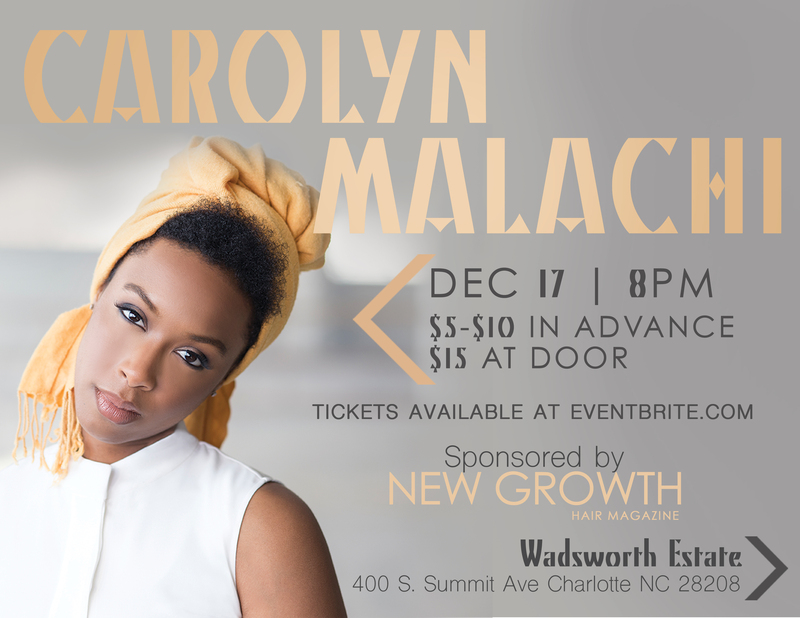 I Am Carolyn Malachi | New Growth Hair Magazine | We capture the culture of urban barbershops and beauty salons. Carolyn Malachi is a Washington, DC native who was influenced by DC’s rich musical history of Blues, Jazz, Spoken Word, GoGo, and R&B. Malachi’s music is a refreshing alternative to the commercially packaged mainstream music options. This past summer, after hearing We Like Money and Blowing Smoke, I purchased Carolyn Malachi’s last two albums entitled Gold and Lion, Fires, and Squares. During my summer vacation, I felt like I really got to know Carolyn Malachi through her music. I was overly impressed with both projects because they were complete bodies of work. I listened to both projects without skipping tracks. 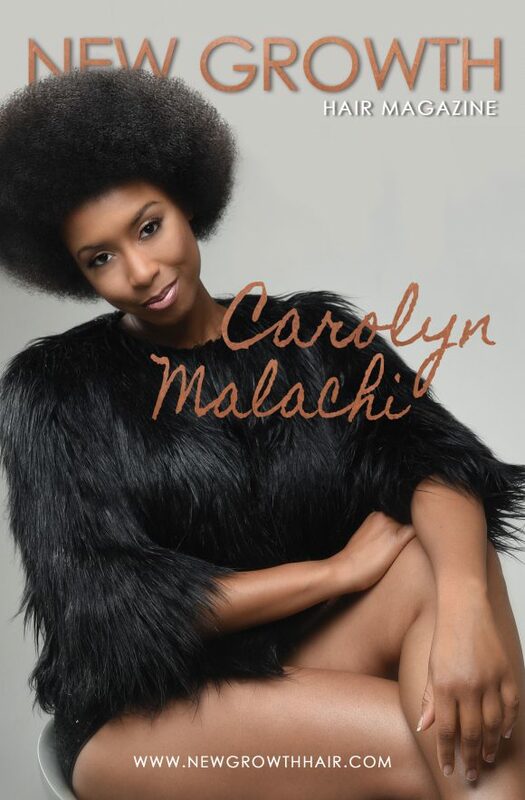 Next month, Carolyn Malachi will release RISE [Story 1], the first part of an album trilogy. Below is my in-depth interview with Carolyn Malachi about her life, her music, her hair, and her travels. Phillips: What do our readers need to know about Carolyn Malachi? Malachi: I am an artist and music is my form of artistic expression. After discovering my musical talents, I’ve been on a journey of personal transformation. Instead of describing myself or my music, I invite your readers to listen to my music so that they can hear and feel my transformative journey. My goal is to inspire, uplift, encourage, enlighten, and entertain my listeners. Hopefully, they will be inspired and begin taking steps toward transforming their lives. Phillips: How do you define beauty? Malachi: For me, beauty is freedom. Beauty is free to show itself in any shape or form. Beauty is the freedom for people to define themselves and to define their moments in time. The antithesis of beauty is the feeling of confinement. I don’t like feeling stuck, feeling forced go places, being forced to go to an unfulfilling job, or forced to be something other than myself. Beautiful people are authentic, organic, free, and in alignment with nature. Everyday, I am seeking the beauty within myself to share with my fans. Phillips: In the past, did you ever question your beauty or did you feel confined? Malachi: Yes, I’ve been in that space before and I’ve talked to so many other people who have been there too. It’s a feeling of insecurity and not knowing who you are, even something as simple as personal aesthetics, looking at yourself in the mirror and knowing that you look different from these representations or interpretations of beauty standards. Sometimes when you look different, your hair is different, your complexion is different, and doesn’t necessarily match what the media tells you is beautiful, you begin to question yourself. Some people develop insecurities when they begin to question themselves. I consider questioning your beauty and accepting someone else’s standard of beauty a state of mental confinement. We are confined when we feel locked into someone else’s definition of beauty that has been engineered and prescribed to us by people who aren’t concerned about our physical, mental, and spiritual well-being. Freedom is redefining the norms. It’s recapturing the essence of who we are, finding value in ourselves, and putting our own self out into the world the way we see fit. Phillips: I heard that you played basketball in college. What position did you play and do you still play or watch basketball? Malachi: Yes, I am definitely a Wizards fan. I played center in college. I wasn’t as tall as most people that played the center position. I am only 5’ 10” and three quarters of an inch, so let’s call it 5’11”. I always felt that my coach was playing me out of position because I felt more comfortable as a small forward. I think the thing that helped me to excel in the center position is that I’m an extremely physical player. I definitely go hard in the paint. I am actually looking for a league to join right now. Phillips: What skill sets did you develop on the basketball court that you use in your music career? Malachi: As an artist, every day I am using the teamwork skills that I developed as a basketball player. Teamwork was a skill that I had to learn because I was one only child for a very long time and I learned how to work independently. Playing high school and college basketball taught me the strength of team building and the importance of building strong relationships, managing personalities, and making sure that everybody is working towards the same goal. I don’t want to give your readers the impression that I was this superstar high school and college basketball player. Most of my high school and college basketball career, I sat on the bench. Nobody likes picking splinters out of their sides from riding the bench but as a bench warmer, I received the gift of vision. While I was sitting on the bench, I watched our coach lead us to victory. I watched my teammates interact, observed the court dynamics, and saw the referee’s facial expressions. When I am on stage with a band, it’s kind of like being on the court. My band members are like my basketball teammates. Phillips: When did you go vegan and why? Malachi: Three years ago, I went vegan and that was because I wanted to reconnect with the creator. For me, becoming vegan was spiritual. I wanted to get rid of some of the practices, some of the people, and some of the ideas that I felt were interrupting my connection with the Creator. I felt that removing animals from my diet was a way to reconnect from a dietary stand point. One morning, I woke up and said ‘this is what I’m gonna do’ and that was the beginning of my vegan lifestyle. I started out completely eating raw foods and later I began to add cooked vegetables into my diet. Now, I think spiritually I am in the place that I saw myself when I began my vegan journey. Phillips: When you are on the road or traveling abroad, how are you able to maintain your vegan lifestyle? Malachi: Before I travel, I usually research what vegan options are available. I try to find out what are the main local dishes. In places like Tahiti and Haiti there’s a lot of meat being served. So when I travelled to those places, I focused on getting the fresh fruits, vegetables, and salads. Also, I pack a lot of Cliff Bars and snacks so that I won’t starve. I don’t worry too much about eating when I am on the road because I don’t eat that much when I travel. I actually end up drinking more water and eating less. Phillips: Have you ever relaxed your hair? If so, when? Malachi: So, I had my first relaxer when I was 12. My aunt took me to get a first relaxer and to get my ears pierced. My aunt always took me to do all of the stuff that my dad wouldn’t allow me to do. When I was about to turn 18, she took me to get my hair done and I wanted to cut off all of my hair. I was preparing to go to college in West Virginia and I wasn’t sure what the hair game was like up there. I didn’t want to be in an unfamiliar place on a college budget and have no place to get my hair done. Since 2002, I haven’t had a relaxer and I don’t see myself with another relaxer because now I know better. Phillips: When you initially cut your hair off, was it really short or was it in a style that we see it in now? Malachi: No, I had like an inch of hair. When I cut my hair off, my auntie took me to a stylist who put a texturizer in my hair. I am not really good at keeping hair appointments, so over time, the texturizer started to wear off and my natural hair started to grow out. After seeing my natural hair, I could see that I didn’t really need the texturizer because my hair is naturally curly. When I got to college, I had a barber just cut it all off and I started rocking a Caesar cut. Phillips: You performed in Haiti. Can you please share with our readers what your experience was like in Haiti? Malachi: My trip to Haiti was a beautiful and enlightening experience. If any of your readers decide to go to Haiti they must visit St. Marc, a town that is about two and a half hours outside of Port-au- Prince. I felt like I was at home amongst French speaking people. I really enjoyed observing the interdependence of the people in Haiti. In the marketplaces, I loved to see the families that work together. I was a little troubled when I saw children who didn’t have the opportunity to go to school because they were helping their parents in the market. The school children who I met were some of the most driven children and young adults that I have ever met in my life. I just remember the trip being very inspirational and I personally can’t wait to go back. My first show was in St. Marc. On a Monday night, 25,000 people who had no exposure to my music came out to watch me perform. When I saw the people dancing and singing, it reminded me that music is a universal language.